As a Canadian, the subject of ice skating is near and dear to my heart, so it’s not difficult to imagine why I wanted to write about ice skating in the Middle Ages. I live in London now, and many fantastic places in the city have opened up for ice skating – the Tower of London being one of them – and it made me wonder (naturally), did medieval people ice skate? When I was doing research about surviving winter in the Middle Ages, and how people passed the time during the coldest part of the year, sure enough, I came across several instances of medieval people strapping on skates and taking a twirl (or a tumble!) on the ice. So where did it begin? Oxford scholars, Federico Formenti and Alberto E. Minetti conducted a study of ice skating through the ages using skates from 1800 BC to the present day, to determine how fast and effective skates were as they evolved over the course of history. The first ice skates appeared about 3,000 years ago in Finland and were made of animal bone. They weren’t initially used for recreation, but as a means to get around frozen bodies of water, to move people and goods, and for trade. They were primarily for survival, to traverse the large number of lakes that dotted southern Finland. Skates were a cheap and efficient mode of transportation. Skating on bone reduced the time and energy of travelling in Scandinavia during the frigid winter months. It might not come as a surprise, but modern skates are four times faster than their bone and wood predecessors. Bone skates only moved at about 8 kilometres per hour, far from the break neck speeds we’re used to seeing today with hockey players, or speed skaters who can reach speeds of 60 kilometres per hour. 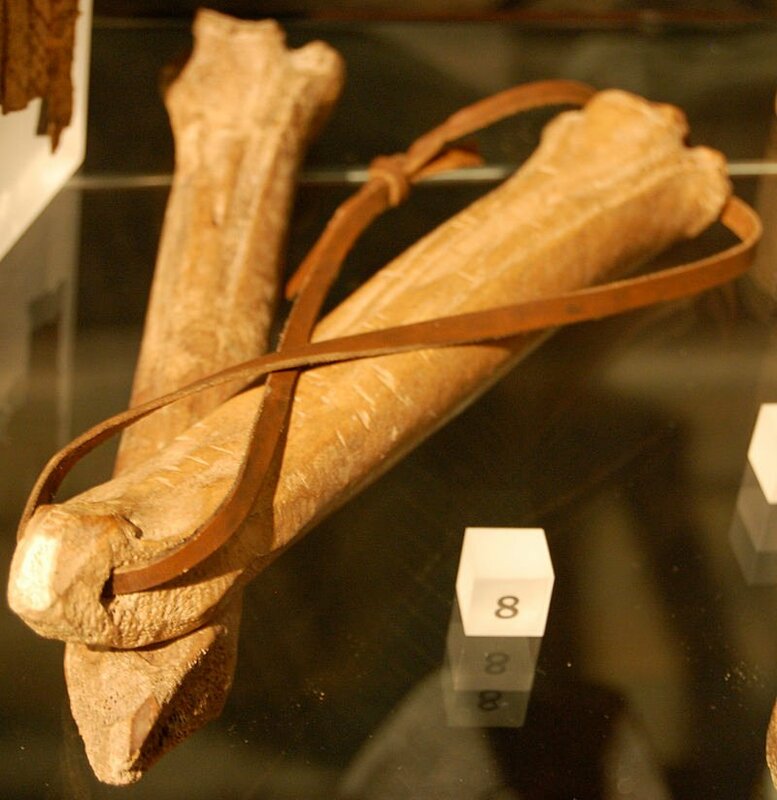 Medieval ice skates made of bone on display at the Museum of London. Photo by Steven G. Johnson, Wikipedia. The pastime we associate ice skating with today didn’t become popular until the Middle Ages. The earliest mention of ice skating was discovered in the twelfth century writing of English monk, William Fitzstephen (†1191). William was employed as a clerk to Thomas Beckett (1118-1170), and wrote extensively about the city of London in his work, Descriptio Nobilissimi Civitatis Londiniae. In the account, he mentioned children attaching bones to their ankles and ‘flying like birds across the ice’. From the 1498 text, ‘Vita alme virginis Liidwine’ by friar Johannes Brugman depicting the fall of Saint Lidwina in an ice skating accident. (Wiki Commons). Another famous medieval story about ice skating involved the Dutch saint, Lidwina of Schiedam (1380-1433). Lidwina was one of the first recorded cases of multiple sclerosis and some scholars have attributed her disability to her fall while ice skating. The story of the incident was recounted in detail in the German friar Johannes Brugman’s account of her life. However, as she could not succeed in recovering her strength, she was confined to her room, where, some days before the Feast of the Purification, some friends visited her. It was freezing hard at the moment ; the river Schie, which runs through the town, and the canals, were frozen over; and in this wintry weather all Holland was skating. These young girls invited Lydwine to skate with them, but, preferring to be alone, she made the bad state of her health a pretext for not going with them. They insisted so much, however, reproaching her for not taking more exercise and assuring her that the open air would do her good, that, for fear of annoying them, she finally, with the consent of her father, accompanied them on the frozen water of the canal behind which the house was situated. She was just starting, after having put on her skates, when one of her comrades, going at a great pace, threw herself against her before she was able to get out of the way, and she was dashed against a piece of ice whose edges broke one of the lower ribs on her right side. ~Johannes Krugman (1498), Saint Lydwine of Schiedam, trans. by Joris-Karl Huysmans. Skates at this time weren’t edged likes modern ones, so skaters used poles with iron tips to propel themselves across the ice, and mock joust with each other and they passed by. Formenti added, “Bones did not have an edge that allowed the typical skating movement pattern, so the forward propulsion was given by the upper limbs as a stick was pushed backwards between the legs while the legs were kept almost straight.” Edges were added by the Dutch in the thirteenth century. The first wooden skates appeared in the Netherlands in the fourteenth century and had a metal blade fixed to the bottom. From this period forward, skates became 30% lighter and were the most popular way of getting around in the Netherlands. Image of people ice skating using poles to propel themselves forward. From Olaus Magnus’, Carta Marina (1539). The other kind of men are those who attach to the soles of their feet a piece of flat, polished iron, a foot long, or the flat bones of deer or oxen, the shin bones, that is. These are slippery by nature because they have an inherent greasiness and achieve a very great speed, though only on smooth ice, and continue to shoot forward without pause as long as the ice remains level. Among this sort too there are found everywhere men who take pleasure in racing for a prize. Their race-course over frozen lakes as smooth as a mirror is fixed at eight to twelve Italian miles from one end to the other, or it can be less. The prizes are silver spoons, copper pots, swords, new clothes, and young horses, but more often the last. The rest are outrun by those competitors in the race who attach to the soles of their feet the shin-bones of deer thoroughly smoothed and greased with pork fat, since, when the cold drops of water rise as it were through the pores of ice during fierce cold, the bones smeared in this way cannot be hampered or kept in check, as iron can however much it is polished or greased. For no greasing suits iron as much as it does the shin-bones of deer or bullocks, which have an innate slipperiness of their own. In this way, whenever the ice, two or three fingers thick, is clear and bared of snow, these shows are performed easily and with little fear of danger; but this is by no means the case at other times, for you are never in greater peril or nearer to death than when you set off skating while the ice is covered with even the thinnest layer of snow. For rivers or brooks, silently and swiftly entering the lake from its shores, wear away the ice by their constant movement so that it cannot grow thick and firm, unless the streams themselves are held in check by a very hard frost. Winter Landscape with Ice Skaters (1608) – Hendrick Avercamp (1585-1634). Bone skates were used well into the eighteenth century in certain places such as Iceland, Gotland, Hungary and Germany. While skating on bone skates was demanding and required expending more energy, it was still safer than walking on ice. Ice skating clubs didn’t appear until well into the eighteenth century, the first being opened in Edinburgh, Scotland. London didn’t establish an ice skating club until 1830. While initially an activity that everyone could afford and enjoy, it eventually became the preserve of the nobility and upper classes. From bone to blade, functional to fun, it’s once again an activity that everyone can enjoy. Happy skating! Human locomotion on ice: the evolution of ice-skating energetics through history, Federico Formenti and Alberto E. Minetti, The Journal of Experimental Biology, 210, 1825-1833, Published by: The Company of Biologists, February 27 (2007). The Similarity of Bone Skates and Skis, B.A. Thurber, Viking and Medieval Scandinavia, 9 (2013), Brepols Publisher.